The passage lies between the islands of Gam and Waigeo. It is only about 25 meters wide and looks more like a river from the surface. A jumble of rocks marks the entrance to this enchanting looking dive site, the coral almost grows to the surface here. There is not much choice but to drop in and drift down the channel, pausing in bays where the current is more forgiving. 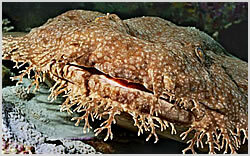 Plenty of life can be found here including octopus, flatworms and cuttlefish, even the Wobbegong shark can be spotted on occasion. Schools of bigger fish await out in the current such as jacks, tuna, barracuda and sharks. Caves and arches also make up some of the topography here. Close by is this recently discovered sheltered dive site where the small island and bays wield a number of flamboyant nudibranchs.